Grenier makes snowboarding look easy with his effortless style at The Freedom Frontier. Scotty Arnold photo. Many outdoor enthusiasts have at one time or another fantasized about having an outdoor Shangri-La, a place to dream up, build, and enjoy whatever the heart desires. From private skate parks to off-the-grid cabins, for those willing to invest the time and finances, building a shred oasis can be accessible to a multitude of budgets. 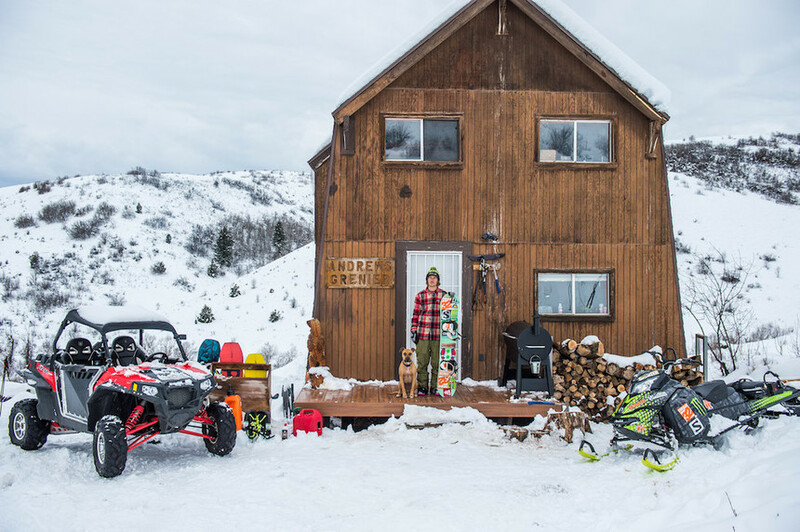 While the most well-known snowboard wonderland might be the DC Mountain Lab, Ken Block’s high-budget and defunct haven, over the last several years a more minimalist approach has been taken by those wishing to build their own interpretation of the dream property. 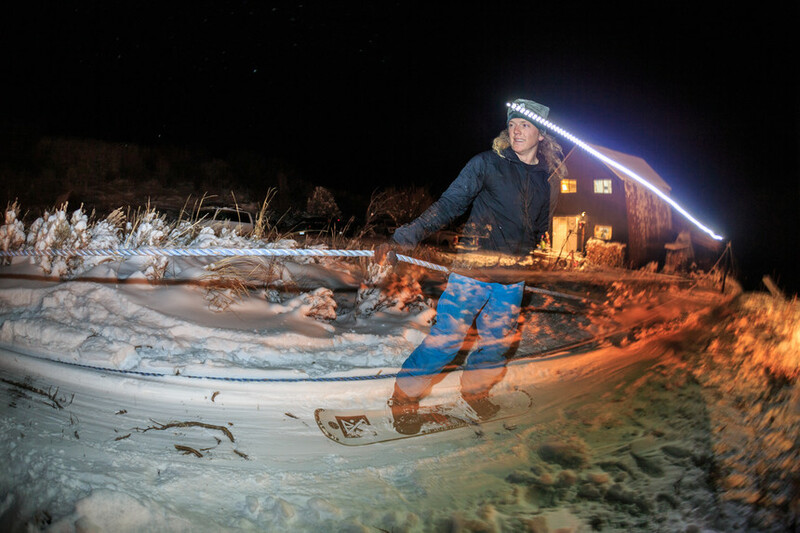 From Tim and Hannah Eddy’s Childerness to Mike Basich’s Area 241, snowboarders are taking an approach that depends more on ingenuity and less on massive budgets. When Salt Lake City-based pro Chris Grenier and Burton Ambassador of Stoke Alex Andrews decided to team up and buy some land deep in the Wasatch, it was inevitable that the duo would eventually build some rideable features. However, what has transpired since the two friends and supremely talented snowboarders procured what has been dubbed “The Freedom Frontier” is truly remarkable. 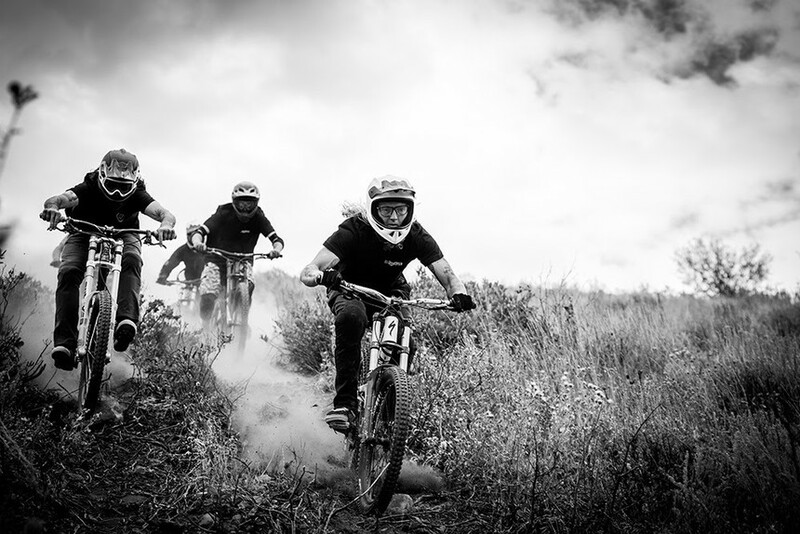 Andrews leads the charge on one the property’s mountain bike trails. Tom “T. Bird” Monterosso photo. Knowing it might not be financially viable on his own he reached out to longtime friend and Salt Lake City local Chris Grenier. Grenier is one of snowboarding’s most colorful characters with an impeccably smooth snowboard style, an infectiously positive attitude, and plenty of rambunctious energy, and was Andrews’ first call when it came to splitting the property. “After that first time scoping the property I knew I had to have it,” enthuses Andrews. “Long story short, I didn’t qualify for a loan. Chris has been a longtime friend of mine, and we were chatting about the spot, and I mentioned we should check it out together. The next day we went up to check it out. It was rad because we had the same vision of what we both wanted from the cabin. After securing the cabin, Andrews and Grenier started brainstorming about what was possible on the property and immediately got to work building their first features. They initially made some upgrades to the cabin and as fall transitioned into winter they set about building the initial snowboard line, which included a lawn mower powered rope-tow that Andrews made. Grenier brought all of his favorite toys to the cabin. Tom "T. Bird" Monterosso photo. While the skate park got put on hold, The Freedom Frontier saw a heavy cast of shredders that first winter as a number of Salt Lake City’s biggest pros sessioned the park. It became a retreat from the often hectic terrain parks that surround SLC. Friends of Andrews and Greiner began flocking to The Freedom Frontier, with world-class mountains at their disposal it wasn’t necessarily the relatively rudimentary private terrain that was a draw to the Frontier–the lack of connectivity at The Freedom Frontier offered a setting for digital detoxing, a benefit that quickly outweighed the private terrain. After the inaugural winter the real work began. Andrews, Grenier, and a large crew of friends began pouring concrete, clearing trials, and fabricating new snowboard features. The results has been one of the most amazing transformations in snowboard fantasy house history. 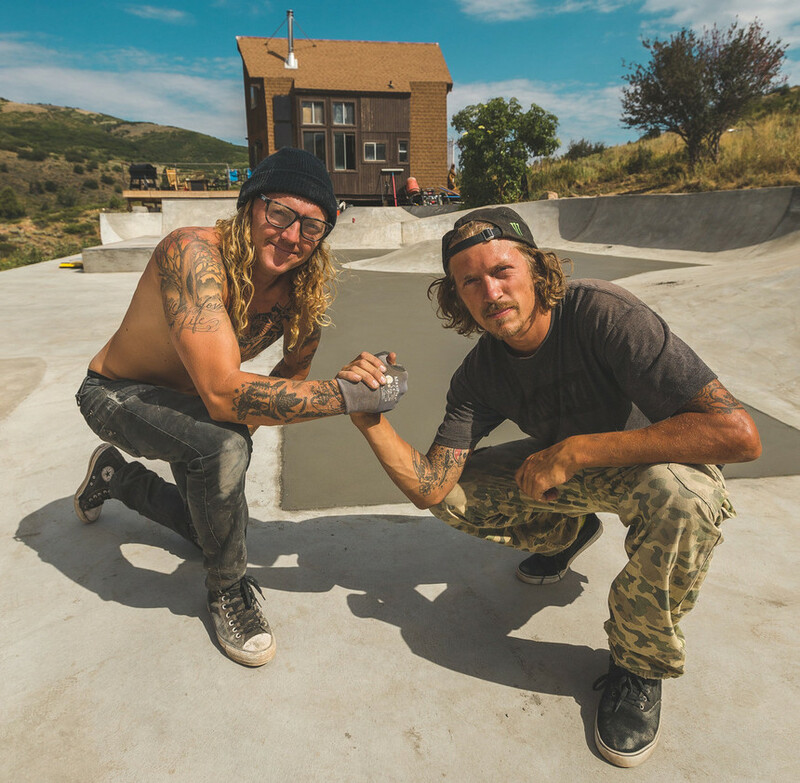 The crew built a full cement skate park with a perfect blend of transition and street features, mountain bike trails with plenty of air sections, and an upgraded rope-tow made out of an old Ford F-150 that Andrews and Grenier winched up a precarious hill on the property. Grenier and Andrews are down for life. Scotty Arnold photo. And while The Freedom Frontier is pretty spectacular as is, Grenier and Andrews say they are just getting started. The cabin has caught the attention of ESPN and the sports network has worked with the Andrew and Greiner to document the process of building The Freedom Frontier in a series called The Cabin Report. Greiner who has competed in and won gold the X Games Real Street series worked with the crew at X Games to produce the new series, a portion of which premiered on ABC’s World of X Games in February. Andrews and Grenier get by with a little help from their friends. Jeremy Jones photo. With Andrews and Greiner's unrelenting enthusiasm and ingenuity, the possibilities are endless. Andrews positivity is infectious and watching he and Grenier’s creativity come to life is a special treat for snowboard fans everywhere. Andrews enjoying the fruits of his labor. Scotty Arnold photo. There are some fascinating deadlines in this article but I don’t know if I see all of them center to heart. There is some validity $1 hosting godaddy but I will take hold opinion till I look into it further. Good article , thanks and we would like more!